Peanut butter, sweetener and cocoa powder. Tis the Season to… Find your will power challenged by sugary temptation..? If ever there was a time of year that is challenging for the low-carb dieter it is this one. The traditional treats of Christmas – cake, mince pies, pudding and an awful lot of chocolate – are all jam-packed with carbs and sugar. A little wavering off course is perfectly acceptable, but if you do want to stay as low-carb as you can then low-carb baking and low-carb “treats” are the way to go. A lot of the food that is around at this time of year is perfectly suitable for low-carbing and delicious anyway – hams, turkey, sausages wrapped in bacon, smoked salmon, fish starters and lots of cheese. There are lots of recipes online for low-carb fudge, but most of them are American and they often use ingredients that aren’t commonly available here. I did, however, find this recipe on a Keto website and all the ingredients are easily available. The recipe didn’t specify whether you should use smooth or crunchy peanut butter, so I went for smooth as I thought that would mimic the texture of fudge more closely. 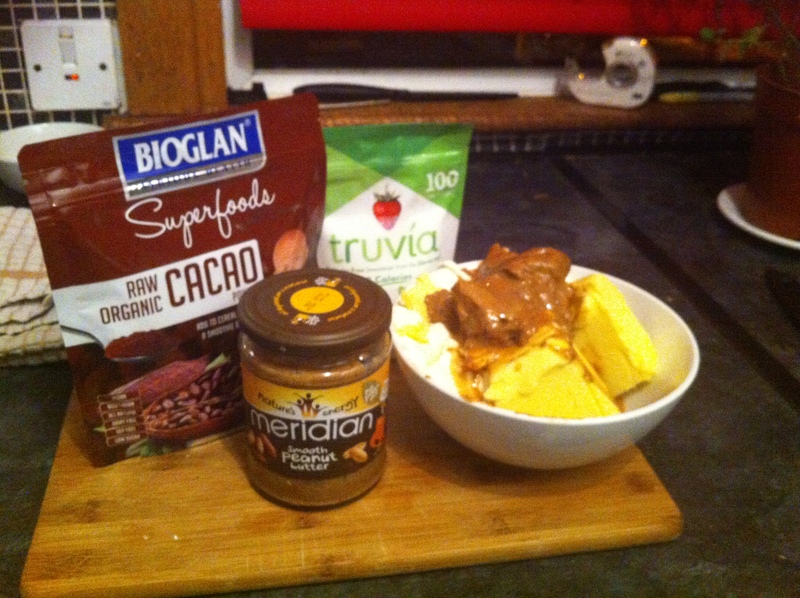 Meridian do a smooth peanut butter that has no salt or sugar in it and you’ll find this in health food shops. I chose Truvia as my sweetener, but Splenda could be used too. This quantity makes about 55 pieces. Count roughly 2g of carbs for each piece. Although it isn’t as sweet as conventional fudge, it is very rich indeed. 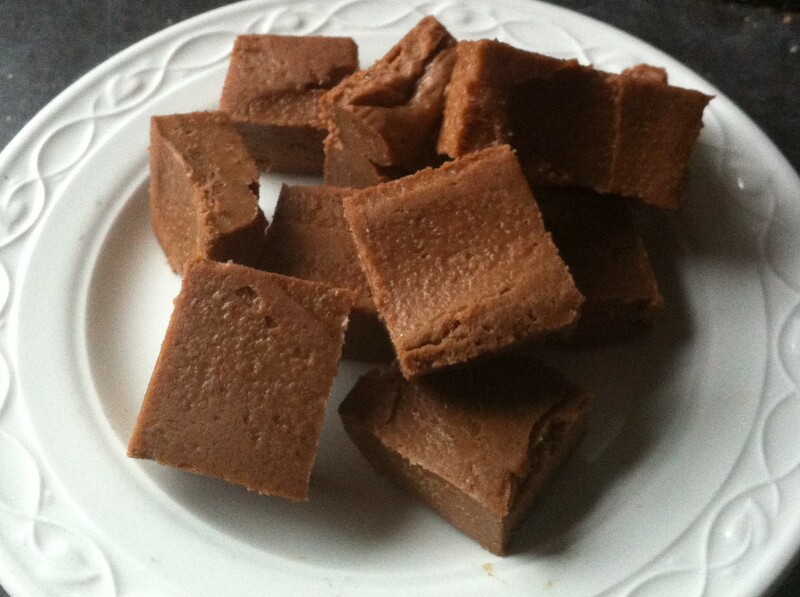 Low-carb fudge usually needs to be kept in the fridge – and this recipe is no exception. I recommend bagging the fudge up in small quantities and storing in the freezer. Line a square baking tray (about 9-ins square) with baking parchment – you will need to line the sides of the pan too. Place the first three ingredients in a large microwave-safe bowl and microwave in bursts of 30 seconds until the three ingredients are soft enough to beat together. Beat together well – the best way to do this is with a hand mixer, as the mix will separate out alarmingly if you use a wooden spoon. Add in the vanilla extract, sweetener and cocoa powder and mix well until it is combined. Put the mix into the lined tray. The easiest way to do this is tip it into the pan and use a palette knife to spread out evenly. Chill either in the fridge overnight) or place in your freezer for an hour or so until it has firmed up. Please note, this will not firm up as much as conventional fudge does and you will need to keep it in the fridge. Previous Post My feet are killing me……what can I do about it?